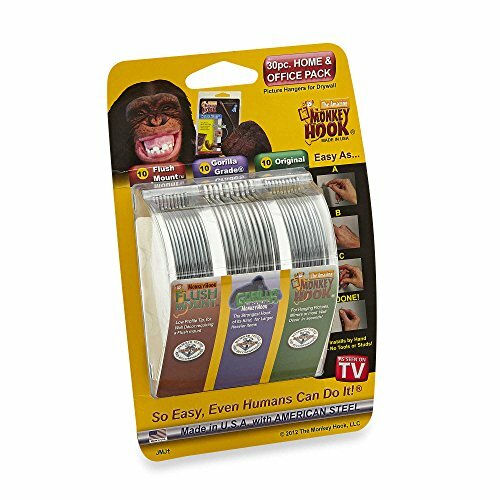 The Amazing Monkey Hook one of the most innovative and fun-to-use products you have ever discovered! Once you try it, you'll want everyone who is important in your life to know about it!! Its Low Profile feature results in a hook that is only nominally visible and makes only a tiny hole. The Amazing Monkey Hook is a lightweight, super-strong spring steel product that enables anyone to hang a picture, mirror, or wall accessory of up to 50 lbs. securely and in just seconds, with No Tools Needed!! This breakthrough product is uniquely engineered to make hanging pictures, mirrors, or 'anything hangable' a simple, easy process anyone can do. Just find the spot where you want to hang the picture and you are seconds away from being finished. Monkey Hook EZ Drywall Hanger' Self-Boring tip enables you to penetrate the drywall, using simple hand pressure and a back and forth twisting motion. Then, the shaft simply slides through and with a final push the Self-Locking Feature locks the MonkeyHook securely in place, with only the hook exposed and ready for your ready-to-hang picture. If you have any questions about this product by Monkey Hook, contact us by completing and submitting the form below. If you are looking for a specif part number, please include it with your message.